What if I told you, you could get everything you wanted in life with no effort? In fact, what if I told you the secret to getting your biggest dreams is by following your joy and living life in a State of Ease. Does it sound too good to be true? Well, it is possible and here is why - Effort is a pushing energy; it includes exertion and is focused on achievement. We live in a society where all of those words are rewarded, but the truth is, that true accomplishments occur without any of those words. I have learned that the big dreams do not come with effort, they come with Ease. Want to try it out for yourself? Join our 30 Day Joy Challenge! 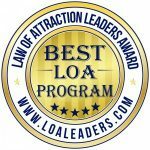 The Joy Challenge was voted the BEST Law of Attraction program for 2016 by the LOA Leaders! Choose one goal that you want to magically, easily, effortlessly show up in your life. Then, for the next 30 days, add more joy to your life. This could be removing something you think you should be doing or adding something you love doing, or BONUS, both! Remove something you do not want to do, but think you should, and replace it with something you would LOVE to do! And, no, your joyful activity should have NOTHING to do with your actual goal (in fact, we are not going to talk about or think about your goal for 30 days, so it can prepare itself to just show up for you!). You will get detailed instructions on how to do all of this in the email by signing up for the challenge, as well as helpful tools for the 30 days. Easy, breezy? You BET it is! 0% Effort, 100% Return, that is what this challenge is all about! In addition, there will be... PRIZES! Why? Because it brings me joy to give stuff away and I am playing full out this month too! Make sure you sign up! Random winners will be selected all month long for free coaching sessions, free content, and some just-for-fun-why-not-because-who-doesn't-love-it cool stuff! Ready to get started? Download the following documents to start prepping for the challenge today! Or, are you doing the challenge by yourself? We do it every April, but feel free to have a 30 day Joy challenge at any time! All of the information is in the links below! 4. 0% Effort, 100% Return from Success University for Women. 5. Why I am doing this - the Joy Manifesto! 6. How to manifest anything you want recording - see link below! Join the 30 Day JOY Challenge for 2020 HERE! I totally respect your privacy! I treat your email, like I would like to be treated! I want to offer everything I have to you, that will serve you! Most of what I offer is either free or you can make a love donation! Having said that, if you want to check out more cool stuff, you can sign up to have my blog posts delivered to you. Want to learn more about Joy Challenge? Watch this short intro video. The kick off call for 2020, will be on Thursday, March 26th!